Sometimes you just want a big ol’ ice cream sundae. And by you, I mean me. Rather than pick some Haagen-Dazs from the market as I so often do, I decided to have an impromptu sundae date. Yes, a sundae date. I texted my pal Adriana to see if she was interested in meeting me for sundaes. A quick response of ‘yes!’ and the sundae date was born! When I think of ice cream sundaes, I think of diners. And when I think of diners, I think of 101 Coffee Shop. I frequent 101 Coffee Shop for their awesome milkshakes, but prior to my sundae date I had never tried their non-shake ice cream treats. I was inclined to keep things simple and straightforward with a classic hot fudge sundae until I saw the brownie waffle sundae on the menu. 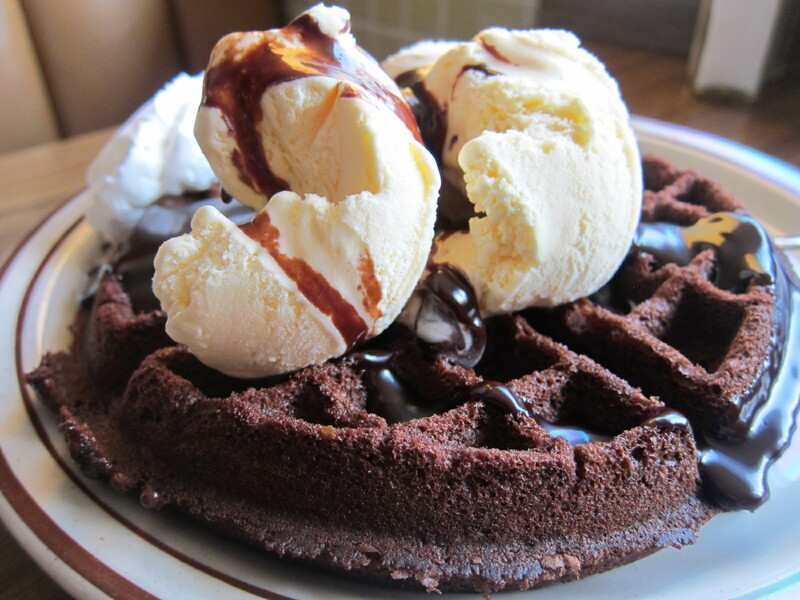 Brownie waffle sundae? Excuse me? Yes please! I was expecting to get brownie chunks atop ice cream all within a waffle bowl, but what I got was much better. 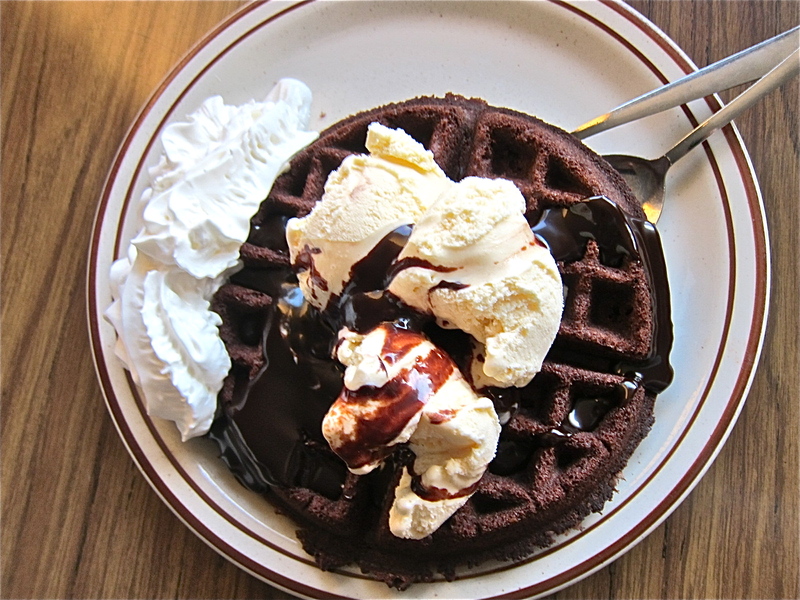 The brownie waffle sundae (aren’t you just drooling from the picture above?) is a chocolate Belgian waffle with ice cream, hot fudge and whipped cream on top. Soft, doughy, chocolatey and warm, the waffle was the perfect contrast to the vanilla ice cream. That waffle was insane. 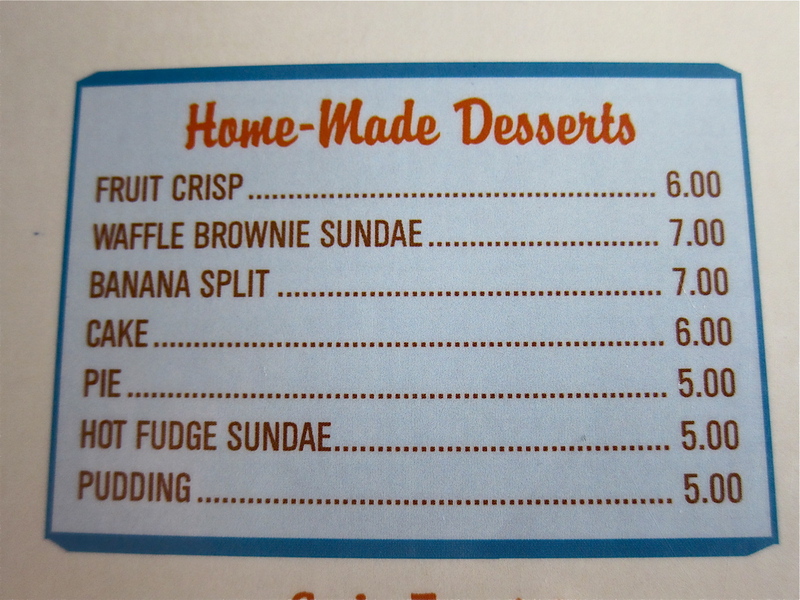 We didn’t stop with the brownie waffle sundae, we ordered a banana split too. 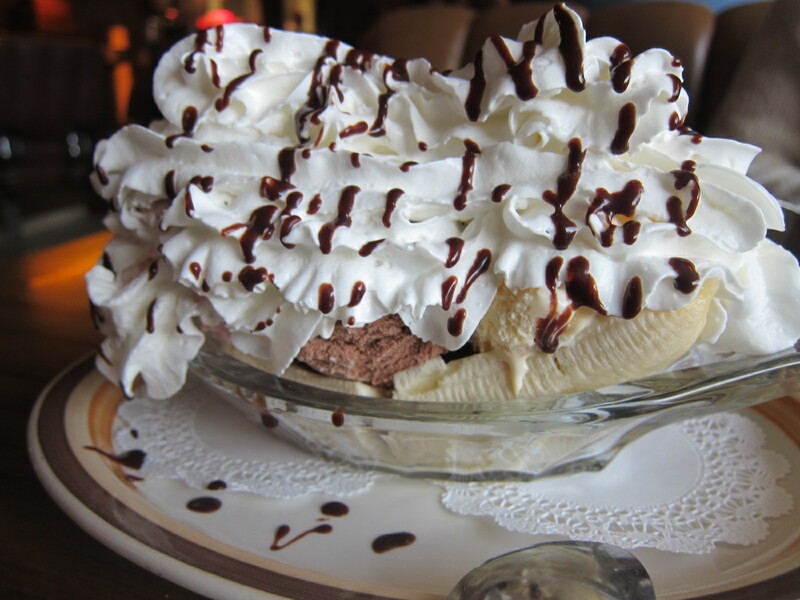 It was everything a banana split should be, simple and satisfying. Chocolate ice cream, vanilla ice cream, and strawberry ice cream nestled between bananas, slathered with whipped cream and drizzled with hot fudge. Eating this I felt like a kid again, in a the nicest way possible. Ice cream sundae dates – I highly recommend having them! i can’t believe i’ve never been there before – good to know they’re just as good for dessert! Love the idea of a brownie waffle! Pure genius! Um, hello?! Awesome sundaes walking distance to my house? Must go. Anna- I thought the same, why don’t ppl make brownie waffles for breakfast! I love how simple the menu is here! JGold says that the hot fudge sundaes at Twohey’s in San Marino are bomb. Come with? OMG! I’m re-living it right now!!! I need to recreate this STAT! Oh and remember how good it went with a coffee?! AHHH! WANT!